A painting by former Guantanamo prisoner Ghaleb al-Bihani, who was released in January 2017. Photo courtesy of Justin Norman via Flickr CC. 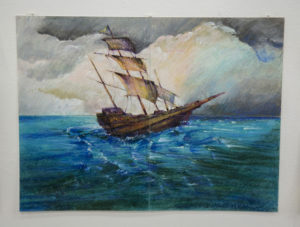 A popular art exhibition in New York that features works by Guantanamo detainees has caused the Department of Defense to ban all art from leaving the prison pending further review of its policy on the matter. Ode to the Sea, which opened on Oct. 2, 2017 and will run through January 26, 2018, is a collection of sea-themed drawings, paintings, and sculptures by eight current and former Guantanamo inmates (four of which are no longer in captivity). The artwork is centered on the theme of freedom, with the sea acting as a metaphor for liberation. But according to U.S. military officials, the decision to halt artwork from leaving the prison has nothing to do with the content of the works themselves, but rather the fact that they’ve been put up for sale. In an interview with the Miami Herald, Air Force Maj. Ben Sakrisson said that Department of Defense officials “were not previously aware that detainee artwork was being sold to third parties,” which is why the Pentagon decided to ban the distribution of inmate artwork until the matter can be reviewed in further detail. Sakrisson referred to the works as property of the U.S. government.